Mountain Fuel are delighted to be the nutritional partner for the 2016 MONTANE® Lakeland 50 & 100. With fellow Mountain Fuellers set to featuring again in the top placings of both races we have a proven track record in delivering effective nutrition strategies, helping runners to get the most out of their runs without the worries of upset stomachs and bonking. 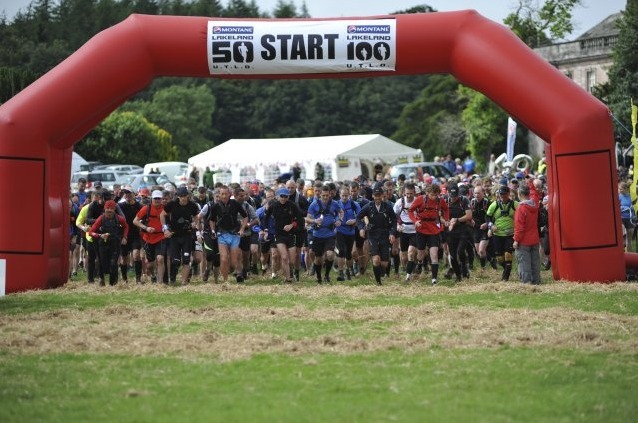 The MONTANE® Lakeland 100 ‘Ultra Tour of the Lake District’ and MONTANE® Lakeland 50 races are the most spectacular long distance trail races that have ever taken place within the UK. The circular 100 mile route encompasses the whole of the lakeland fells, includes in the region of 6300m of ascent and consists entirely of public bridleways and footpaths. The ML100 starts in Coniston and heads South before completing a clockwise loop which takes in the Dunnerdale fells, Eskdale, Wasdale and Buttermere before arriving in Keswick. From here the route heads to Matterdale and continues over to Haweswater before returning via Kentmere, Ambleside and Elterwater to the finish at Coniston. The ML50 route is the second half of the 100 and starts from the Northern end of Ullswater within the grand Dalemain Estate before following the Eastern shore line as far as Howtown. A quick climb and descent followed by a trek along the banks of Haweswater sees you at Mardale Head. The route from here visits Long Sleddale, Kentmere, Ambleside, Langdale and Tilberthwaite before the final climb and descent to the finish at Coniston. It is a truly amazing route and you will visit places that you never knew existed, places which are ignored by the masses.. The route does not pass over any of the ‘popular’ Lakeland summits. Instead, it weaves its way through stunning valleys, contours picturesque fells and cuts its own line through the amazing Lakeland topography. The ML100 & 50 will take you to places in Cumbria you may never have visited before and it’s likely you’ll wonder why. Over the coming year we will be posting route pictures and blogs to help inspire you and also aid your nutritional planning. In the meantime read the following blogs from to of last years participants. Dave Troman, finishing 6th and Andy Slattery finishing in 15th despite suffering a broken foot 20 miles in.